evil chef mom: Bourdain, Homme & The Best Christmas Ever! Bourdain, Homme & The Best Christmas Ever! Warning: I am about to display my geeky, nerdy self for everyone to see! Anthony Bourdain is doing a No Reservations Christmas Special with Queens Of The Stone Age! Bourdain in a suit! Queens Of The Stone Age rocking out in the basement in really bad QVC holiday sweaters! Yipee! 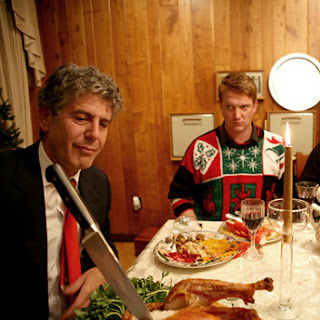 Look at that picture, Josh Homme looks like he's going to strangle Bourdain. Please don't do that Josh, my very existence would end if Tony wasn't on the planet. Please, Josh, I'm begging you..... maybe it's all in my imagination. I guess I will have to watch Monday Dec. 10th at 10:00pm on the Travel Channel. * Does that picture remind anybody of their own family?